Equiped with a nose sensor, actuator and fins, Sandia Labs’ small-caliber prototype seeks and finds laser-painted target. 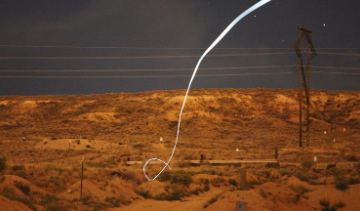 Engineering researchers, Red Jones and Brian Kast, at Sandia National Laboratories have patented a design for a dart-like, self-guided bullet for small-caliber, smooth-bore firearms that could hit laser-designated targets at distances of more than a mile (about 2,000 meters). 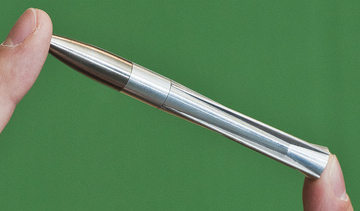 The four-inch-long bullet includes an optical sensor in the nose to detect a laser beam on a target. The sensor sends information to guidance and control electronics that use an algorithm in an eight-bit central processing unit to command electromagnetic actuators. These actuators then steer tiny fins that guide the bullet to the target. To allow the Sandia bullet to turn in flight, conventional rifle barrel grooves (i.e. rifling) — and the spin they impart — had to be eliminated in favor of a smooth-bore barrel. In addition, the Sandia bullet’s design is akin to a dart with its center of gravity shifted forward and fins for aerodynamic stability. Plastic sabots provide a gas seal in the cartridge and protect the delicate fins until they drop off after the bullet emerges from the firearm’s barrel. The prototype does not require an inertial measuring unit, a device found in much larger guided missiles. Instead, the researchers found that the bullet’s relatively small size when compared to guided missiles “is helping us all around. It’s kind of a fortuitous thing that none of us saw when we started,” Jones said. According to the Sandia bullet’s patent, computer aerodynamic simulations showed an unguided bullet under real-world conditions could miss a target more than a half mile away (1,000 meters away) by 9.8 yards (9 meters), but a guided bullet would get within 8 inches (0.2 meters). Physical testing has shown the electromagnetic actuator performs well and the bullet can reach speeds of 2,400 feet per second, or Mach 2.1, using commercially available gunpowder. The researchers say it could reach standard military speeds using customized gunpowder. Sandia is seeking a private company partner to complete testing of the prototype and bring a guided bullet to the marketplace. Potential customers for the bullet include the military, law enforcement and recreational shooters. 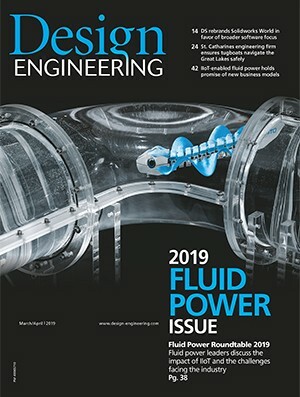 In addition to Jones and Kast, Sandia researchers who helped develop the technology are: engineer Brandon R. Rohrer, aerodynamics expert Marc W. Kniskern, mechanical designer Scott E. Rose, firearms expert James W. Woods and Ronald W. Greene, a guidance, control and simulation engineer. Siemens announces agreement to acquire Canadian network supplier RuggedCom Inc.